So, as part of my new year’s resolution to read more (see number 4, here), I signed up to a book club. 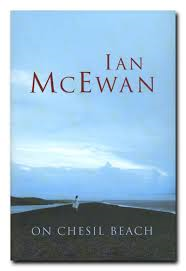 The first book on the list was On Chesil Beach by Ian McEwan. You may be familiar with his novel Atonement, which was adapted for the big screen and brought to life by Keira Knightley and James McAvoy. I downloaded On Chesil Beach straight to my Kindle (yes, I know, but I still read real books too) and curled up on the sofa to start reading. I hadn’t actually read the book description, so I wasn’t quite sure what I was in for. I was soon introduced to Florence and Edward; a newlywed couple in 1962. The majority of the action (*sniggers*) takes place in a hotel room on the night of their wedding. Both of them harbour deep anxieties about the expectation to consummate their marriage. What follows is a very honest and intimate depiction of two young lovers on their wedding night. It’s a short book (technically it’s a novella) with only one main plot throughout, but as can be expected from McEwan, On Chesil Beach is a beautiful piece of writing. Unsurprisingly it was selected for the 2007 Booker Prize Shortlist. I did enjoy this book and was impressed by McEwan’s depiction of the two young lovers and even more so, how he convincingly wrote about such a personal experience from the perspective of both a man and a woman. I would definitely recommend reading it if you enjoy beautiful language and clever word play. In terms of plot it’s pretty much single stranded, but what do you expect from a novella? I didn’t make it to the book club meeting after all, instead I’m hoping to attend a less official one set up by a friend of a friend. What started as two girls has now grown and become a whole group (worthy of a group page on Facebook) of girls and I think it will be a better fit for me and what I’m hoping to get out of ‘Book Club’. Since I won’t make their February meeting due to my New York trip (WOOP WOOP WOOP!!!!!!) I’ll have to wait till March. So right now I’m reading The Redbreast by Jo Nesbo and so far, I’m thoroughly enjoying it! What are your thoughts on book clubs and what are you reading now? Book clubs are a great idea! I’m currently looking for one actually. I do get frustrated with disorganisation though so a disorganised book club can be annoying. Also, I read slow (that sounds special!) so can sometimes need a fair bit of time to get through them. Also, you should get a goodreads account OK so I can steal your book ideas. kplzthx. Jen, you should totally join the book group I’m going to! It’s an unofficial one set up by a couple of girls and it’s grown quite a bit already. I can add you to the FB group? What’s the deal with Kindle Unlimited? Mine is currently broken but hoping to buy a new one soon!